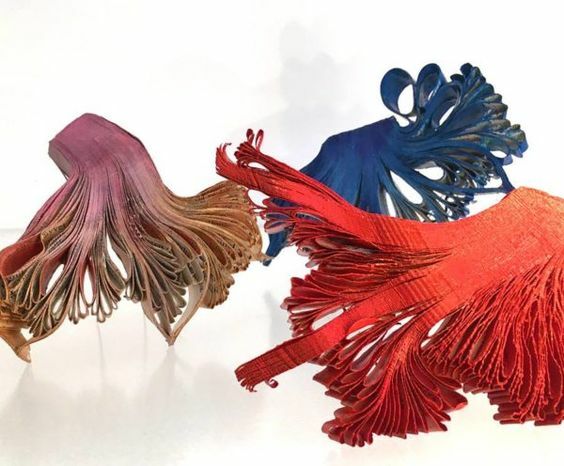 The Gallery at Reinstein|Ross is proud to present “Read and Worn” an exhibition featuring the work of five international artists who transform the pages of books and newspapers into unique works of wearable art jewelry. These artists are storytellers, who utilize the printed word as their form of expression. Whether using publications in their entirety, or simply using a few sheets of print, these artists give new life to the printed page. 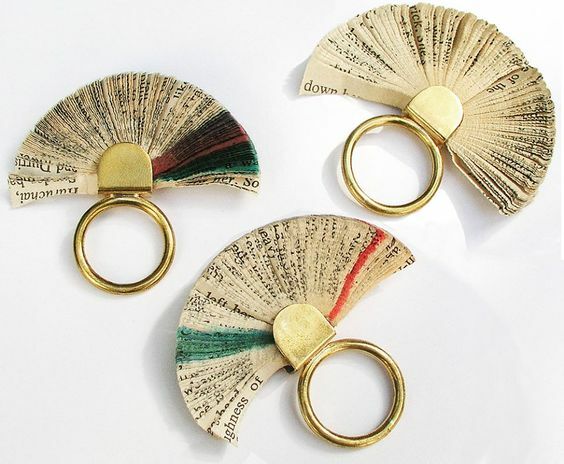 In the spirit of “intellectual recycling”, discarded newspapers and old books – literature, history and news – are given a second chance as bracelets, necklaces, earrings, and rings. Paper has long been a popular material for the creation of art, with artists often hand-making their own paper. Using the pages of books, newspapers, encyclopedias, however, is a recent trend, ironically spurred by the popularity of e-readers and online publications, and thus the abandonment of the printed and bound book. Hungarian artist Flora Vagi loves the smell of old books. 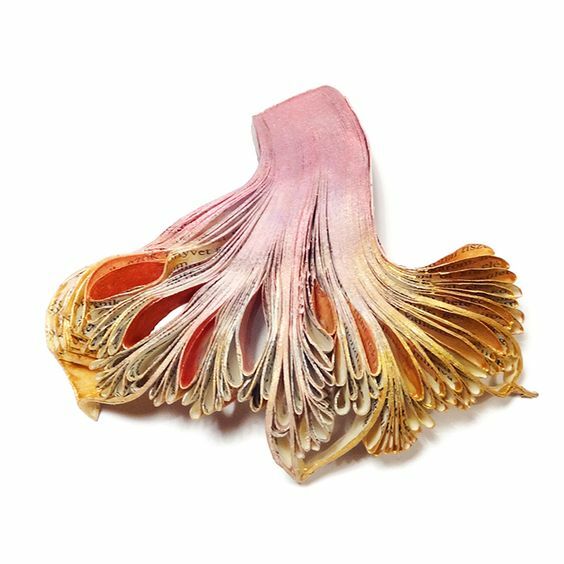 Collecting old books, she removes the pages to create brooches inspired by marine life and floral forms. 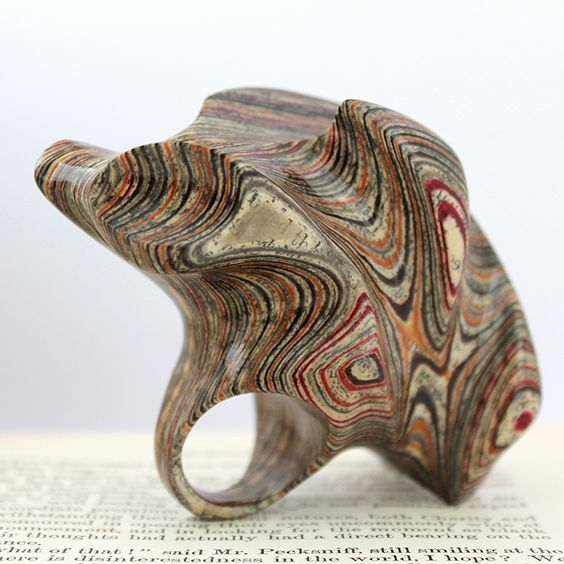 Vagi’s multilayered brooches are organic and curvilinear, just the opposite of the original structured and bound books. Vagi refers to her work as “intellectual recycling”, she enjoys knowing that these books, once found on someone’s shelf, have gone from inhabiting a private space to a public one when worn on the body. Vagi, is a celebrated art jeweler who often works with wood. 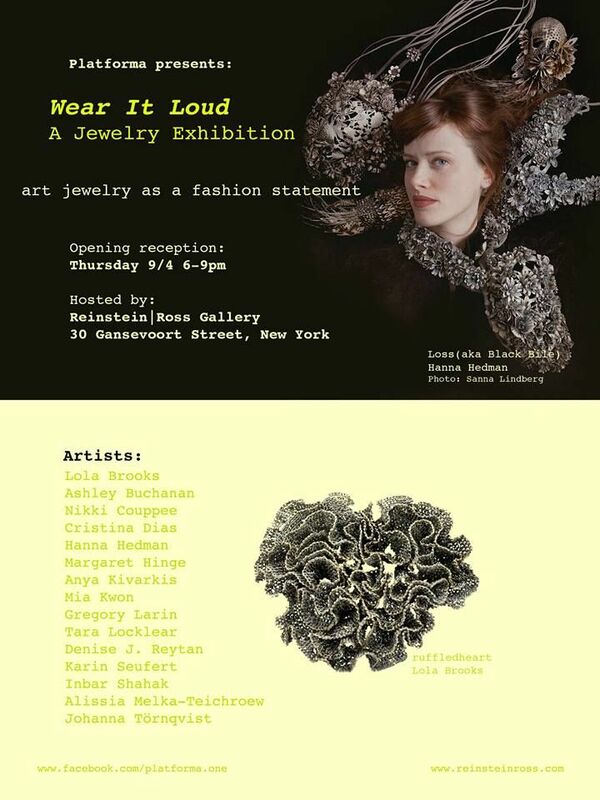 In “Read and Worn” she will show her paper jewelry in the United States for the first time. Since childhood, Korean artist Kiwon Wang, has been inspired by paper. Not only is paper used freely in Korean domestic architecture, but growing up, her family always had an extensive library of books. 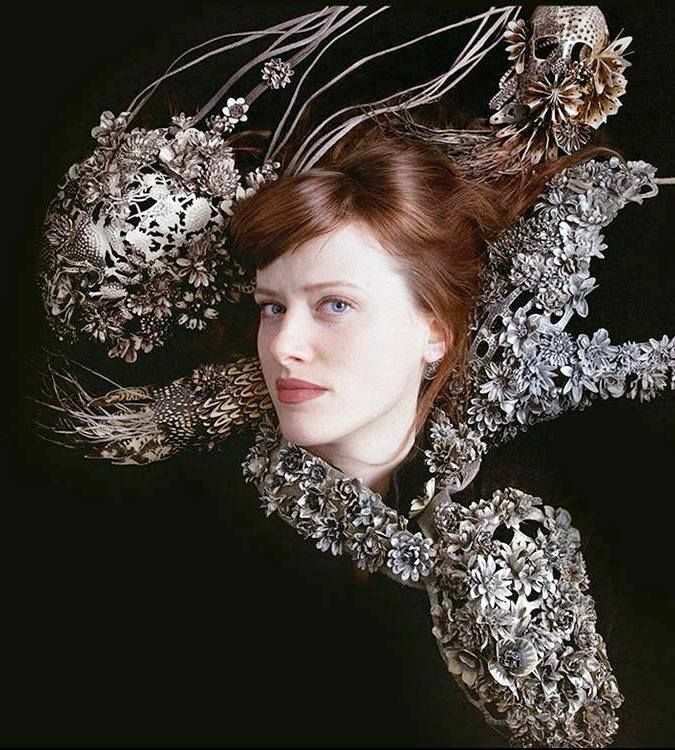 Encouraged to “find out who she is”, while in graduate school at the Rhode Island School of design, it was obvious to Wang that paper, pearls, and metals were going to be her materials. Even now, printed paper is Wang’s material of choice. 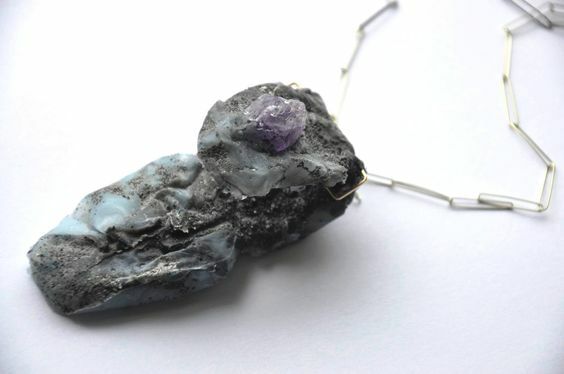 Wang chooses articles from old newspapers to create necklaces, brooches, and bracelets. 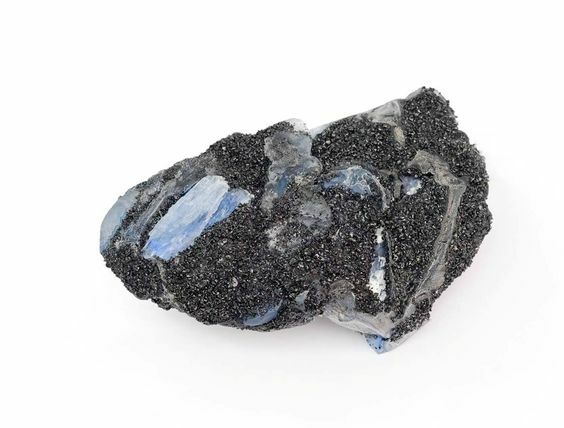 Most of her pieces are adorned with pearls, the lustrous gems prized for their beauty in both Western and Eastern cultures. Wang is attracted to spherical forms, not just because this shape represents the earth but also because process of recycling is circular. London-based artist Jeremy May purchases books from his local thrift store. After reading each one, he chooses a story that inspires him the most and turns it into a wearable sculpture. 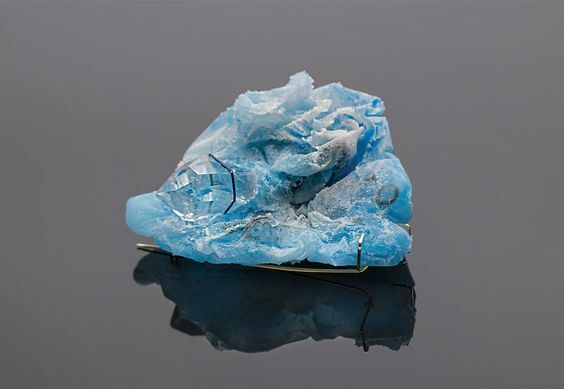 May selects the pages that he carefully removes from the book, laminating as many as a hundred sheets together, then applies a high gloss finish before reinserting the jewelry into the excavated space within the book. 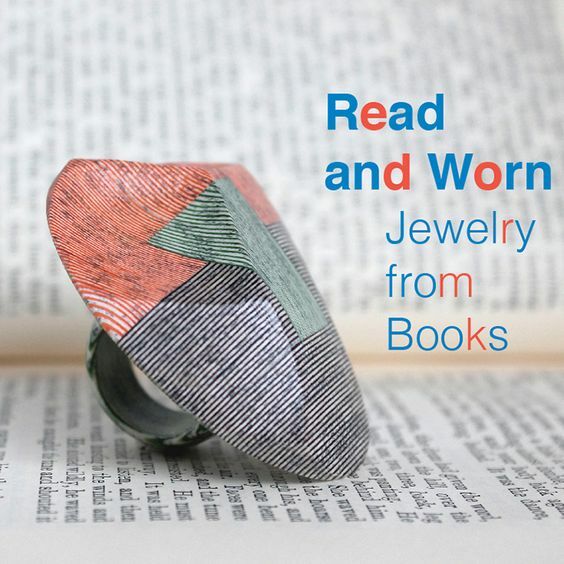 Through his jewelry May hopes to give books a “new lease on life” and inspire people to fall in love with them all over again. 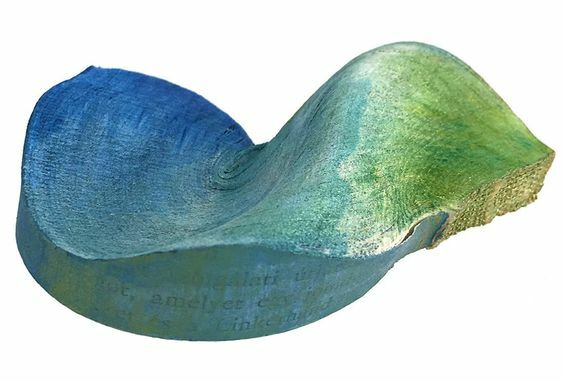 Israeli native Shiri Avda in her work “The Mechanism of Reading” aspires to provoke the viewer with an experience equivalent to reading and leafing through the pages of an old book. Her objects, meant to be both worn and displayed on the wall, are carved from discarded books and embellished with an old lace pattern. Her second series, “Rock Paper Scissors” is inspired by the “world of texture and color” in the printed word. Avda does not conceal the typeface here, instead choosing to reveal the beauty of the printed pages that she takes from antique books and atlases. 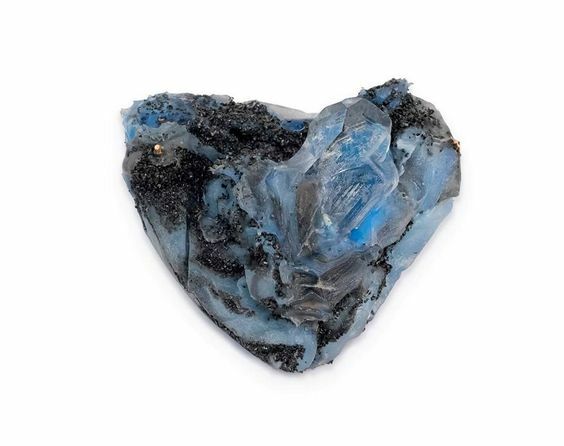 A fan-like shape – a flourish of paper - is often used in her pendants, rings, and brooches. 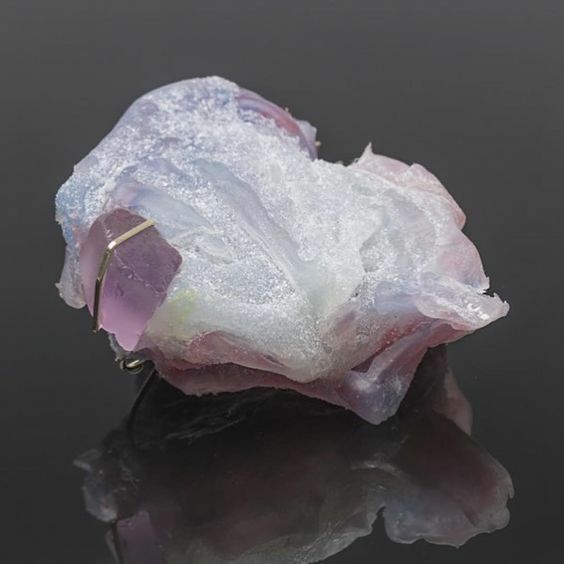 British artist Katherine Richmond trained as a jeweler and silversmith but her Graduate thesis at the School of Jewellery, Birmingham City University, UK prompted her to explore working with alternative materials, including books. 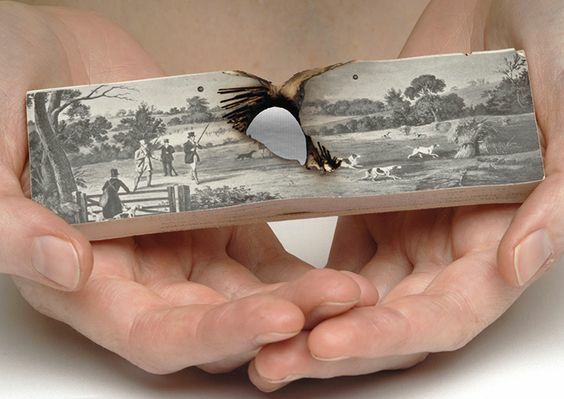 Richmond utilizes pages from multi-volume Victorian journals and books, focusing on illustrations which she believes are rarely ever seen by the public, to create multi-layered and highly detailed brooches, necklaces, and pendants. 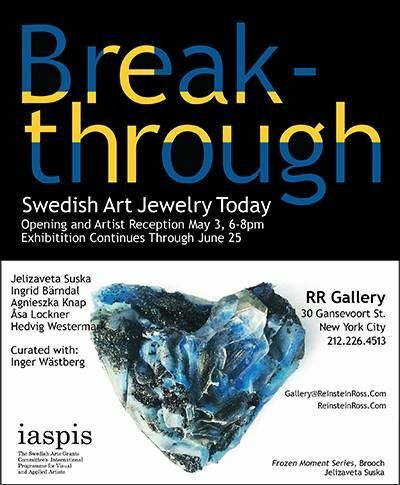 Unlike the rest of the artists in the exhibition, Richmond’s jewelry is full of strong images by which she creates her own narrative. 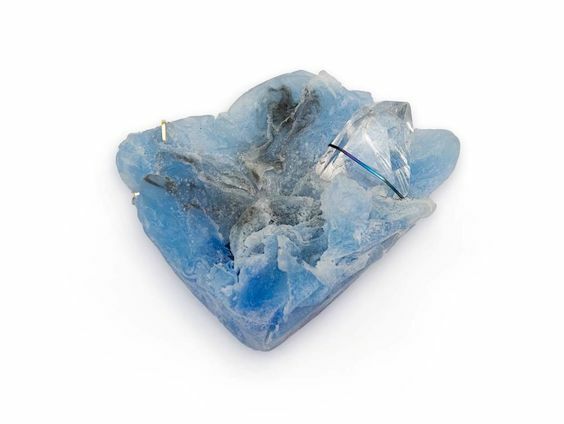 She “uses books as a symbol of permanence and longevity to create wearable objects with a fragility that questions traditional notions of wear-ability.” Paper, she says, is a lot more durable then people think it is.